Nathan was drawing recently and said to me, "It won't be perfect," to which I replied "None of my quilts are perfect, but they're still good." Aiden, who was also in the room, laughed, thinking I was being rather proud, but I explained that there's nothing wrong with being confident enough in our own abilities to recognize that we do a good job at something. However, my confidence in my abilities aside, I am well aware of two things: my quilts are not perfect and, in the end, they are only quilts. They have no power to change anything or improve my life other than by being pretty and cuddly. As much as I love my quilts, they are in no way worthy of worship. The prophet Isaiah wrote a whole section in which he marvels at those who make things so they will have something to worship. It seems rather laughable, doesn't it, that a person would make something with their own two hands and then claim that the thing they made is a god? I doubt that many in this day and age are tempted to worship things created from a block of wood, or a chunk of metal, or even a few yards of gorgeous fabric. Sometimes, though, we are just as deluded as those idol-making craftsmen of old. While we may not physically bow down to anything, we are often tempted to worship things that are not worthy of our worship. Dictionary.com defines worship as "reverent honor and homage paid to God or a sacred personage, or to any object regarded as sacred." 'Any object regarded as sacred' could mean anything. There are those who view their work as sacred, while others feel that way about their hobbies, or sports, or their children. Still others worship popularity and public opinion. Many, of course, worship money and the accumulation of wealth. All of these things we are tempted to worship have one thing in common - they have been created by people. People, sinful and imperfect as we are, cannot create anything worthy of worship! We may laugh at the craftsman who would make, and then believe in, his own god, but we need to be aware of our own attitudes towards the things of this world. It is very easy for things to become the focus of our worship without us being aware of it, so we must constantly and consciously return our hearts to God. We were created by God for relationship with Him, but if we choose not to focus on Him as the object of our worship then something else will fill that void. 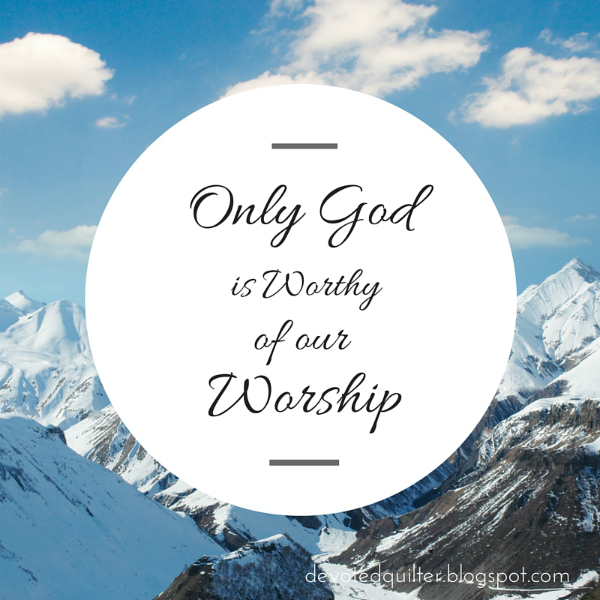 However, only God is worthy of our worship. If we worship anything else, we are led by deluded hearts and feeding on nothing but ashes and lies, as Isaiah put it (v. 20).